JackQuest is a wonderful little indie game that covers the basic tropes of an RPG storyline. What it does, it does well. Unfortunately as a budget title made by a small group, what it does is also very little. I enjoyed my time with Jack as he saves Nara from the evil Korg, but it was over as fast as it started. 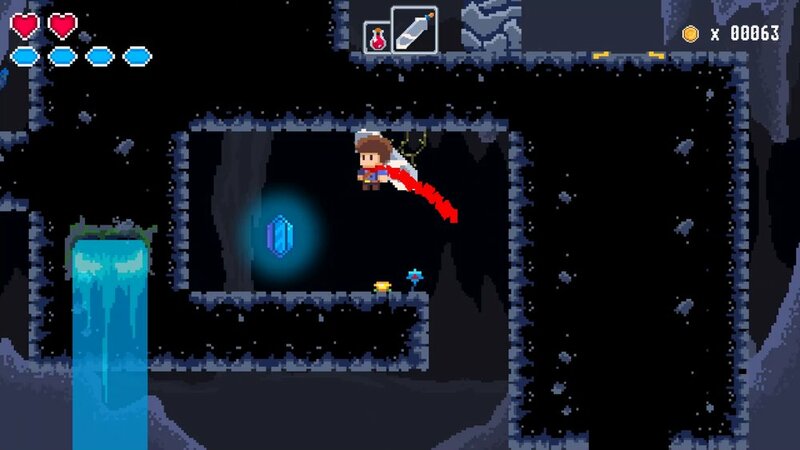 It offers a Metroidvania feel but throws a pretty steep difficulty curve your way. If you're willing to get through the tough startup you will have a lot of fun, but by that time you are nearing the end. Nara and Jack go for a walk in the woods. 30 seconds in just as Jack is mustering the courage to profess his love Nara is kidnapped by Korg and taken to his underground lair. Jack finds a giant sword posessed by a warrior who was sealed in by Korg himself, and together they delve into the depths of the dungeon to rescue Nara. Add in hunting for a couple keys to get to the final boss, and that's the entirety of the story. I'm not expecting a deep tale in a budget title, but it is rather barebones. You pick up the sword that the warrior was sealed within, and as you battle he ends up talking a bit, but there's never any history as to where he is from or why he is there. In a game called JackQuest: The Tale of the Sword, we never actually hear the sword’s tale. The hardest part of the game is the health bar. At the beginning you have two hearts, each worth two hits. While your sword cuts a wide swath, it does mean that you have to get close to do damage (you do unlock a bow and arrow, but it is weaker and not as useful) which lines you up to get hit. Enemies move rather sporadically so they may end up turning right around and hitting you. You can find extra hearts to add to your health bar but still only max out at twelve hits. 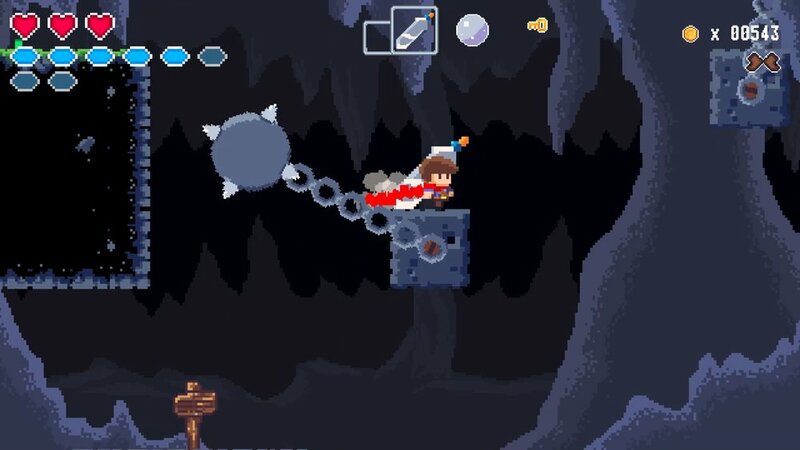 Given you have to find (rare) vials to add half a heart or buy them for 50 coins apiece (which requires risking health to kill enemies), I found myself living on the bottom half of my health bar. I got frustrated as I made it to the final boss with three hits to my name. This wasn't enough for me to win, as he would spawn regenerating skeletons to attack me. So I spent another hour scrounging, save scumming every time I got slammed or made it to a save spot with an extra sliver of life. I went back to the boss, and he ended up summoning other, much easier lackeys and was a cakewalk. It's frustrating to have to break out of an action game by taking advantage of the save system just to have a chance to win. JackQuest is fun, but I just feel as if it could have used some more playtesting. It reminds me of my kids making Mario Maker levels and then showing them off to me: there were times that I wouldn't know what to do so my kids would have to point their intended direction. 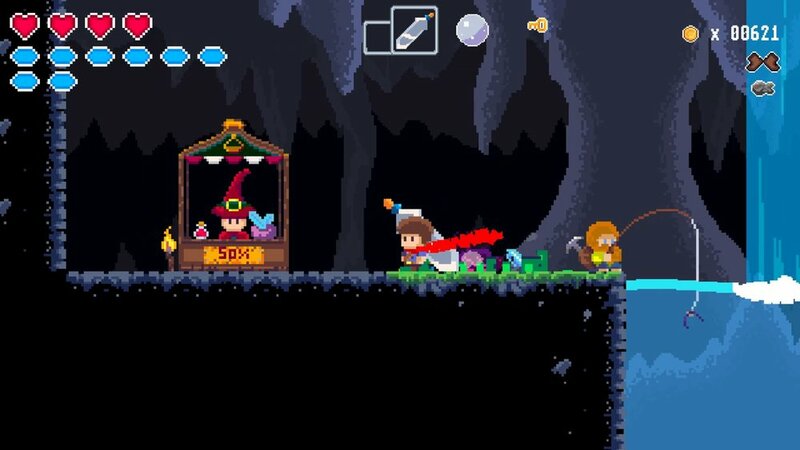 JackQuest has a MetroidVania maze to it, but the permanent power ups are hidden behind secret walls you stumble upon if you get lucky. Eventually you get a map but it's a zoomed in portion of the map that is difficult to navigate across long distances. There are five total bosses with basic patterns to memorize. Save points do nothing to heal you, meaning if you get to an area with half a heart left you're stuck reloading a previous save over and over until you muscle through an area unscathed or luck upon some health potions. Like I said, there's likely a particular way to get through unscathed, but I'm not sure if it's broadcast as well as it could. I felt that Jack's control scheme was a little floaty. With the tension of losing those hard-earned life points, every wall jump was a sphincter-clinching leap over deadly spikes that could set me back twenty minutes of health-hunting work. The game had a few achievements built in (despite the lack of achievements on a Switch) but they glitched a bit. I have the final boss achievement now, but the next-to-last boss achievement is still locked. The last two bosses can be beaten in any order, but I lost the recognition after beating them outside of the order on the Achievement list. I'd also like to simply see the game start on the main menu on "continue" instead of "new" as I'd pop in to play the game and accidentally start over at the beginning. With only one save point, that can be dangerous. So, yeah. As a budget title, there is a lot that could stand to be polished but what is there is rather fun. I'd like to see the developers push the ideas a little farther, as JackQuest only feels like part of a whole. The entire map can be traversed in a few minutes once you have substantial powers (you acquire double jumps, and a bow and arrow that give you a dash powerup), and I comfortably completed the quest over the course of a single Saturday. There are story bits that could have been fleshed out and a couple NPCs that could be better explained. Despite those frustrating one-hit save hallway runs, I enjoyed my time saving Nara. I could see this being a great game for speedrunners, as you can dash straight for the bosses for an Any% run or find all the powerups rather easily for a streamlined 100% run. JackQuest offers at least the $10 asking price in entertainment, it just won't do much for you afterwards unless you love to aim for that perfect run. Thanks to NX Games and Blowfish Studios for providing a download code for review!